Authorized by Congress, 1836. Taken over by Confederacy, 1861. 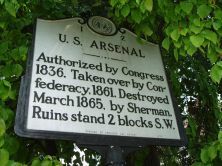 Destroyed March 1865, by Sherman. Ruins stand 2 blocks S.W. Built in 1838, the United States arsenal in Fayetteville was essential to the Confederate war effort. In 1836, the federal government purchased almost 100 acres in Haymount, in west Fayetteville, for construction of an armory to supplement similar facilities in Georgia and Virginia. Architect William Bell designed the complex to have a fortified watchtower in every corner, with ammunition storage and machine shops in the middle flanked by officer and enlisted quarters on each side. After construction was complete, the armory at Fayetteville served as the main distribution point for weapons and ammunition, relieving the armory at Harper’s Ferry after abolitionist John Brown’s raid there in 1859. 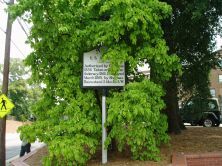 When President Lincoln asked North Carolina governor John W. Ellis to help suppress rebellion in neighboring states in April 1861, Ellis quickly pledged his loyalty to the Confederacy and ordered all federal property seized. On April 22, Lieutenant Delagnel surrendered the arsenal. Confederate officer Samuel A. Ashe oversaw improvements made to the arsenal in 1863, including the construction of almost 500 buildings, with farms and fisheries to transform the arsenal into a virtually autonomous city within Fayetteville. Given the vital role of the arsenal to the war effort, the facility drew Sherman to Fayetteville on March 11, 1865. His troops invaded Fayetteville and set fire to the complex the next day; personnel and equipment had been evacuated the day before. The Arsenal House, built in 1862, is the only surviving structure from the arsenal. Located directly behind the Museum of the Cape Fear, it stands in tribute to both the arsenal and the men and women who manned it.